I own a pair of OB11-3’s that are stacked at 42 feet and 85 feet (14m and 28m). They are phased with an Array Solutions Stackmatch II. I have been very pleased with these antennas. Optibeam uses some unconventional fabrication techniques. The antenna boom is square. The elements are insulated from the boom. They use custom fasteners when assembling the elements. What I can say is that it all “works” and that it has proven to assemble easily, it mounts on masts and TIC rotors with no problem, and it gets out. 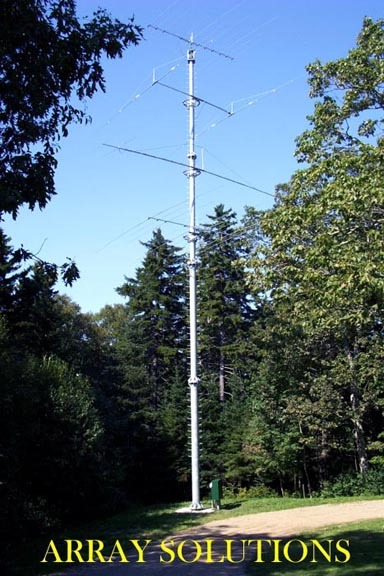 In the past I have used a variety of wire antennas on 10-15-20 meters, and I have also used several beam antennas (all Cushcraft, such as the 20-3CD and the A-4S). The performance of the Optibeams is far superior to anything I have used before. My experience with the Optibeam antennas has always been on low power, 100W or less. These antennas have given me a new level of pile-up confidence. I now know that if I can hear something I can work it, and I wade into large pile-ups knowing that I will work the pursued station. In the recent CQ WW DX contest (CW) I tuned around 15 and 20 meters looking for interesting casual DX contacts and worked whoever I wanted, often on the first call. The real test came with TO4WW, where the pileups were ferocious. No problem – first or second call on both 15 and 20 with 100W. Recently I used the stacked pair in the ARRL 10M Contest and was very pleased. Band conditions were difficult but I was able to work consistently into Europe when other stateside stations seemed to be having a lot of trouble. On phone, where stations often made short comments on my signal, there were numerous instances of “wow, you’re loud.” That’s never happened to me before. I am a believer in this antenna. It is not a tribander, it is a “triple-monobander” and it has made 10-15-20 meters into a totally new experience for me. I have complete confidence that you would be pleased by the performance of the antenna and that you would be satisfied by doing business with Optibeam and their partner in the US (Array Solutions). I would buy this again without hesitation, and the only reason I could ever envision changing this antenna (the pair) would be to upgrade my installation to a bigger Optibeam such as the OB16-3. I am very happy with the OB2-40. I have been using it for about 6 weeks and just used it in the 2003 CQ WW CW Contest. My primary 40M antenna is a 40M3L from M2 and the OB2-40 is on a separate tower at 70 feet. The beam is turned with a TIC ring rotator. I bought the OB2-40 because I wanted a back-up antenna for 40M, which is my favorite band. But I also wanted to see, for myself, the differences between a shortened 3 element yagi on 40M and a shortened 2 element yagi. My station is set up for easy A/B switching between the two antennas. I have been very pleased with the performance. In lots of A/B comparisons with the 40M3L the OB2-40 has performed well. 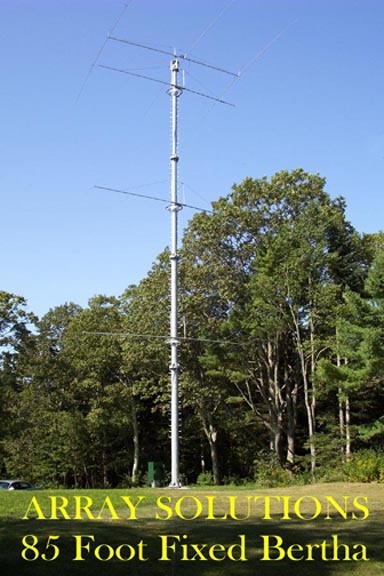 The 40M3L is on a tower that is in a slightly more favorable part of my lot, and it sits a bit higher than the OB2-40, but the differences between the two are hard to discern. On real long-haul signals you can hear a very slight improvement in the signal-to-noise ratio, but on the typical DX signal out of Europe or Africa it is hard to hear much of a difference. For someone who is constrained by space or tower loading, the OB2-40 would be a fine choice and you would have no regrets. The OB2-40 has a very clean mechanical design. The elements are shortened with low loss, air wound inductors made of aluminum tubing. The inductors are far more “close in” to the boom than those on the Cushcraft 40-2CD, and there are no “hats” associated with the inductors. As a result there is far less of a moment on the elements and along with a truss arrangement the elements exhibit VERY little sag. In the mechanical design there are numerous clever mechanical characteristics – such as a very neat approach to fastening the elements together. Optibeam doesn’t use rivets, bolts, or hose clamps, but instead uses a unique fastener that pops together easily and shows no likelihood of coming undone. The electrical design is quite stable. My QTH, in Maine, is on the sea coast and experiences stiff breezes from time to time. The OB2-40 bounces around in the breeze a bit but the impedance of the antenna seems to stay quite stable. I did have one problem with the antenna initially, which was remedied quickly by Jay Terleski of Array Solutions. I bought the antenna from Array Solutions, knowing that it would be one of the first of the OB2-40’s installed in the US. I did have some difficulties with the feed mechanism (a hairpin-type match) and Jay came up with a solid solution to the problem that I believe Optibeam has decided to adopt in production models. The match on my antenna is a solid 1:1 at the target frequency of 7030 kc/s. In summary, this is a great antenna. I am very happy with it. I would buy another one in a second and for a single tower station this would be an excellent choice as a primary 40M beam. The president of Optibeam, Tom, DF2BO, is a great guy and takes a personal interest in his installations. Together with Jay Terleski at Array Solutions you will get great support on any issues or questions you might end up having.